Today I bring you this fine specimen of a Hebrew tattoo, a token of brotherly affection that is supposed to read "Eternal Brother"... but does not. In fact, it's hardly readable at all. Unless you know what you're looking at, you'll probably never realize it's Hebrew. In this case - a definite advantage for the victim. Anyway, when deciphered, it actually comes to say "Olam Ach" in Hebrew, which translates to "Brother World" (you know, like Twin Towns... but galactically). The mixup stems from two factors - Olam, which means world, can also mean eternal - but only in suitable context. Also, there's absolutely no elegant way to say "Eternal Brother" in Hebrew without sounding dumb. Just one of those language things. Sure looks like 'Kish-kush L'netz'ach' to me. (קיש-קוש לנצח I can already hear his brothers claiming "We don't even know this guy." wow, you finally managed to decipher it! this tattoo has been debated for quite a while now on Flickr (right here: http://www.flickr.com/photos/doobiebros22/2698139570/in/photostream/) and the guy simply refused to disclose what it was supposed to read. No matter what it says, it seems like the emphasis is on the design, not the words. He is not the only one, by the way. 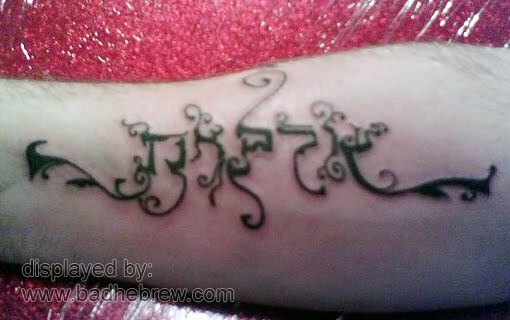 We get requests for Hebrew tattoos from people who are more concerned with the looks of the tattoo than the actual meaning. How about akh tamid? Or akh l'olam? Even akh nitskhi? Not sure what Eternal Brother means. Yours might be better but the others aren't totally lame.